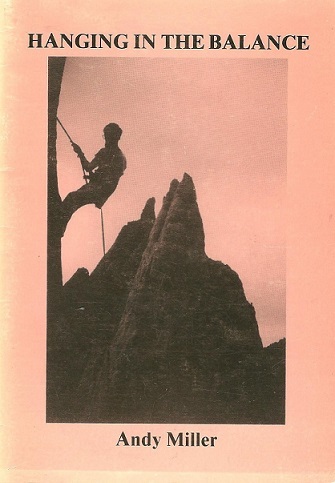 Published in 1988, Hanging in the Balance was a collection of writing about survival in relationships and climbing. Who can say when or how hope springs? Today like a ray of sunlight, a small book has landed on my desk … It may already be a collector’s item … For there is a breath of humanity in this book … Having this book in my hands for half an hour was like sitting on the grass with my back against a tree. It made me sway. This brave, fragile pamphlet of four essays and six poems deftly tells the story of hanging in the balance as climber, father, companion, husband, club-member and divorcee. It begins with a crag rescue and ends with the challenge of Christmas Day alone, ‘without self-pity or cynicism.’ This is the best writing I’ve read for ages. Better than whole books of empty narrative, this little bit of autobiography climbs through the important things in life. It will repay re-reading.